Service Costs > How Much Does Palm Tree Trimming Cost? Palm tree trimming is required to guarantee the tree retains its color and continues to be attractive. Trimming the tree will also maintain its size so that it is more manageable, preventing it from overgrowing. How much does it cost to trim palm trees? 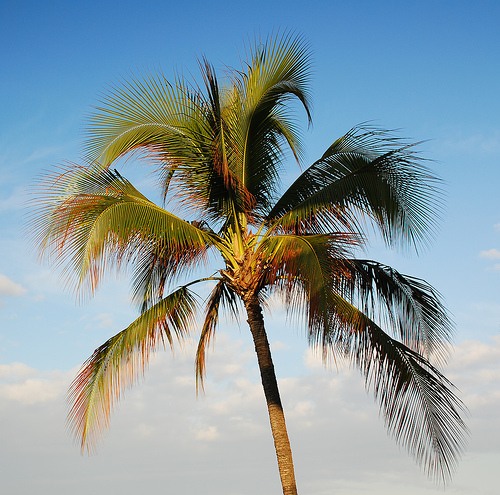 The cost trimming a palm tree will come down to your geographical location, the contractor/landscaper performing the job, the type of palm tree, the size of the palm tree and the number of palm trees that need to be trimmed. On average, however, most homeowners pay $35 to $125 per tree. Forum members on City Data stated that the “norm” is usually between $40 to $80 per tree. The Las Vegas Sun claims trimming a palm tree can be as little as $20 to more than $150 per tree. Skinning can often be done California and Mexican Bark trees for about $8 to $12 per foot. Some landscapers who have to travel outside of their radius may add a mileage surcharge. Most landscaping services will remove the brown, yellow and any broken fronds, along with any flower and fruit stalks. These stalks will be removed because they use this energy to create newer fronds and because it can pose a safety hazard for those who walk underneath the tree. If the green leaves are removed, only those that droop at an angle parallel line to the ground will be trimmed. For taller trees, landscapers will use either a ladder, specialized climbing gear or a cherry picker if it’s able to access the tree. Due to dangers of the job, always make sure the landscaper has some sort of liability to protect you in the case of an accident since homeowners will be considered liable if something were to happen on your property. Most landscapers will carry a one million dollar liability policy. Always make sure the company’s license is valid by checking your state’s official database. Colder weather and freezes can usually mean more fronds for your tree. Pay close attention to the fronds to see how they have fallen by the summer. If they have fallen slightly, then it may make sense to hire a trimmer. If you wait too long, the fronds can open up, spreading seedlings everywhere, which can create a large mess. Understand that palm trees will get its nutrients from the leaves on the trees. If too many are removed at once, the growth will slow down and the tree may become susceptible to disease. As palm trees grow, a new frond will grow as another one dies, so it’s important to watch out how often you trim. Experts will only recommend trimming only when necessary and when doing so, only remove fronds yellow or brown in color. Fronds with this color can often house insects and other rodents. While climbing spikes were used in the past, any reputable landscaper will avoid using them today because of the damage these boots can do to the tree. These boots are also known to transfer diseases from tree to another. The crown should never be cut off as it will not grow back, ultimately killing the tree. If possible, try to hire a landscaper with a certificate or some sort of qualification, such as a Certified Arborist. Before hiring a service, always ask how they will trim your tree. You will want to avoid companies who over prune the tops or shape it in unnatural ways. A reputable company will show you pictures of jobs they have done in the past. For smaller trees, you may want to consider doing the job yourself as there are tools for rent or for sale that can help you save on labor costs. The more trees that are trimmed in one session, the more you will save per tree. Get multiple quotes delivered to your email for free by using online comparison websites like Home Advisor. If your city has a bulk trash pickup option, consider having the landscapers place your fronds on the side of the road for pickup. This could help save on disposal fees.